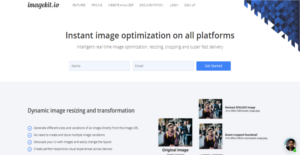 ImageKit is an image optimization solution that offers smart image optimization in real-time, enabling you to easily optimize images via dynamic resizing and cropping as well as seamless and fast delivery. It offers a friendly platform that lets you tweak all elements of your pictures without losing image quality. The software allows you to reduce images sizes while retaining high quality resolution. and still retain high visual quality. You can also automate image configuration according to quality settings, image content, and device used. For an affordable monthly rate, you enjoy access and use of Global image processing servers, Global CDN for delivery, a secure storage site for your images, and unlimited image requests and transformations. ImageKit makes it easy for you and your team to fully optimize your images for SEO and other purposes. You get to perform all transformation processes on your images, such as resizing, cropping, watermarking, and more directly from the image URL. That means you don’t have to download the images and store them into your system before you can do all the work. The software is equipped with a Smart Crop feature, a functionality that helps you deliver perfectly resized images based on the end user devices. As different devices have their own requirements and different variations of the same image, this feature makes image delivery smooth and seamless, resulting in less work at your end and a great experience for your users. There will always be the need to reduce image size if you are to optimize your pictures. The problem with image reduction is that visual quality suffers as well. But that is not the case with ImageKit. The software utilizes a plethora of image reduction and compression techniques and optimization so that quality is not lost and load times remain blazingly fast. The same can be said with GIF images when converter to smaller animated WebP format on supported devices. If you are considering ImageKit it might also be beneficial to analyze other subcategories of Best Digital Asset Management Software gathered in our base of B2B software reviews. Since each organization has unique business requirements, it is prudent for them to desist from looking for a one-size-fits-all ideal software system. Needless to say, it would be pointless to try to find such a platform even among widely used software solutions. The intelligent thing to do would be to jot down the various vital aspects that require consideration such as key features, finances, skill levels of workers, company size etc. Then, you should do your homework thoroughly. Read some ImageKit reviews and investigate each of the other systems in your shortlist in detail. Such comprehensive research can make certain you reject ill-fitting applications and select the system that offers all the aspects you need for business success. How Much Does ImageKit Cost? ImageKit offers the following types of plans. ImageKit also offers a flexible plan based on client needs like pay on a per bandwidth requirement or consumption. We realize that when you make a decision to buy Digital Asset Management Software it’s important not only to see how experts evaluate it in their reviews, but also to find out if the real people and companies that buy it are actually satisfied with the product. That’s why we’ve created our behavior-based Customer Satisfaction Algorithm™ that gathers customer reviews, comments and ImageKit reviews across a wide range of social media sites. The data is then presented in an easy to digest form showing how many people had positive and negative experience with ImageKit. With that information at hand you should be equipped to make an informed buying decision that you won’t regret. What are ImageKit pricing details? What integrations are available for ImageKit? If you need more information about ImageKit or you simply have a question let us know what you need and we’ll forward your request directly to the vendor.